wooden paneels. Many thin layers of paint and fine brush strokes create the depth and detail that characterizes his paintings. Schall is constantly pursuing higher standards of realism and accuracy. To achieve this he spends a great deal of time in the field collecting, observing and noting nature in all its moods and seasons. Schall has a big love for the outdoors and that has shaped his life and inspired him in his artistic approach. Portraits of wildlife are Schall's favorites because they focus the viewer's attention and allow the artist to bring out the character of the animal. The subjects for his artwork are varied and numerous. 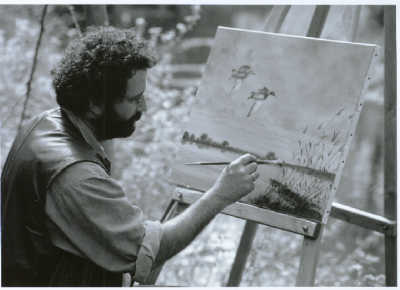 He has a preference for European Wildlife such as wildboars,ducks and foxes which are his favourite animals to paint. In addition Schall also paints a wide variety of Northamerican wildlife including wolves,moose and bears. His goal as an artist is to keep exploring the idea of putting life into his paintings. Schall is certainly an artist who has "paid his dues". After studying biology at the university of Tübingen and working as wildlife-biologist for many years , Schall decided to pursue a career as a professional artist. After years of doing art shows and fairs, perfecting his technique,Schall developed a style that is uniquely his own. inspiration, he also paints at his base in Canada and while travelling around the world.